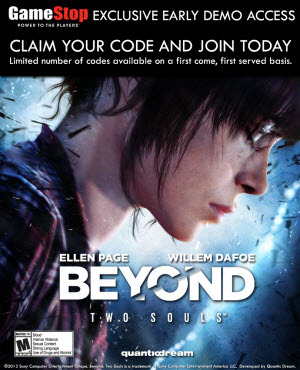 Beyond: Two Souls game – an upcoming dramatic action-adventure – is coming at the beginning of October, but already now you can get the access to its demo version to decide whether this exclusive PS3 game is worth your attention. Beyond: Two Souls demo is going to be released very soon, on the 1st of October, while the game itself is coming a little bit later – on the 11th of October in Europe. But today GameStop has announced an interesting offering, according to which you can get the access to the demo already now. All you need to do is to like the special GameStop’s Facebook page and receive your coupon. In Beyond: Two Souls demo you will be able to explore several different episodes from the protagonist’s life, starting at the girl’s childhood. With demo you will be able to understand whether this mysterious psychological story is interesting for you and whether it is worth your attention. Some gamers have already got their access to Beyond: Two Souls demo and decided to show their in-game footage to everyone. We would like to present you the 32-minutes long video from the upcoming project, so you will be able to see everything first-hand.